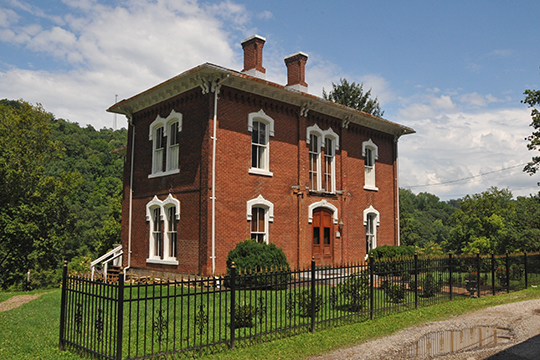 West Union administrative offices are located at 300 West Court Street, West Union, WV 26456; phone: 304-873-1400. Photo: Lathrop Russell Charter House, ca. 1877, 109 High Street, West Union, WV. Listed on the National Register of Historic Places in 1993. Photographed by user:Jerrye and Roy Klotz, MD, 2007, (own work) [cc-by-3.0 (creativecommons.org/licenses/by/3.0)], via Wikimedia Commons, accessed November, 2015. West Union, the county seat of Doddridge County, is located in north central West Virginia. It is included in the Mid Ohio Valley region due to its proximity 35 miles east of the Ohio River. Clarksburg, the closest principal city, is 26 miles to the east. James Caldwell was the first known landowner in Doddridge County, in 1787 he patented 20,000 acres of land, including the land of present day West Union. Caldwell sold this land to Nathan, Joseph and William Davis around 1807, the Davises then moved to the current West Union area. Soon after purchasing the land the Davises sold 16,000 acres of the 20,000 acres to Lewis Maxwell, a Virginia Congressman. The area was at one time called "Lewisport" in honor of Lewis Maxwell. Nathan Davis was influential in the establishment of West Union as a town and as the county seat in 1845. It is believed that Nathan Davis suggested the name of West Union, as the town was west of Lewisport or as it was also known, Union, and Middle Island Creek. West Union was incorporated by the Virginia General Assembly on March 14, 1850, and by the West Virginia legislature in 1881. The oil and gas industry in Doddridge County began to develop during the late 19th century. In 1892 oil and natural gas were first discovered. By 1906 the oil industry was booming in West Union. This was a very prosperous time for West Union and coincides with the construction dates of many of the West Union homes. The homes were large and opulent in the most current styles, displaying the owners' wealth. Some of the oil and natural gas companies in Doddridge County included the Philadelphia Company, South Penn Oil Company, Carter Oil Company, Carnegie Gas Company and Hope Natural Gas Company. A partner industry to natural gas is the glass industry, due to the large volume of natural gas needed to manufacture glass. The Ideal Glass Factory was the first in the area, built in 1906. The Doddridge County Window Glass Co. was founded soon after the Ideal. Approximately 300 jobs were created during the winter months at the two glass factories. Many of the workers came from out of state to work seasonally. While the transitional workers were in town, local families would rent out extra rooms. This was a prosperous time for West Union. It was during this time that the current courthouse was built (1903) and the first roads, Main Street and Columbia Street (1914), were paved. However, when machinery was created to produce glass and the cost of natural gas rose, the glass industry ended in West Union. Like many cities around the country, the prosperity of the oil, natural gas and glass industries was enjoyed until the stock market crash in 1929. This was followed by 10 years of depression and then a business pick-up brought on by World War II. The oil industry in Doddridge County has continued to contribute to the County's economy, but not to the level that was seen at the turn of the century. There was a brief oil boom in West Union during the 1960s. The June 25, 1950 flood of Middle Island Creek was disastrous. Seventy-eight homes, two churches and numerous business places were greatly damaged or washed away. Twenty-five lives were lost. Growth in West Union originally centered around the downtown area, including Main Street, High Street and the courthouse. As industry developed, housing needs increased, resulting in expansion and the resulting residential area. The majority of the homes in the West Union Residential District were built at the turn of the century, coinciding with the prosperity of the oil, gas and glass industries. These homes are representative of the connection between industrial growth and residential growth. Anna Phoenix, Commissioner's Fellowship Intern, West Virginia State Historic Preservation Office, West Union Residential Historic District, Doddridge County, WV, nomination document, 2010, National Park Service, National Register of Historic Places, Washington, D.C.